In 2010 Gorska web site was chosen in the top 3 business web sites in Macedonia. In 2011/12 Gorska won the title of Macedonian Superbrand. To create a website that would bring the brand closer to the market encouraging retailers to trial it, and consumers to swap their brand of choice. 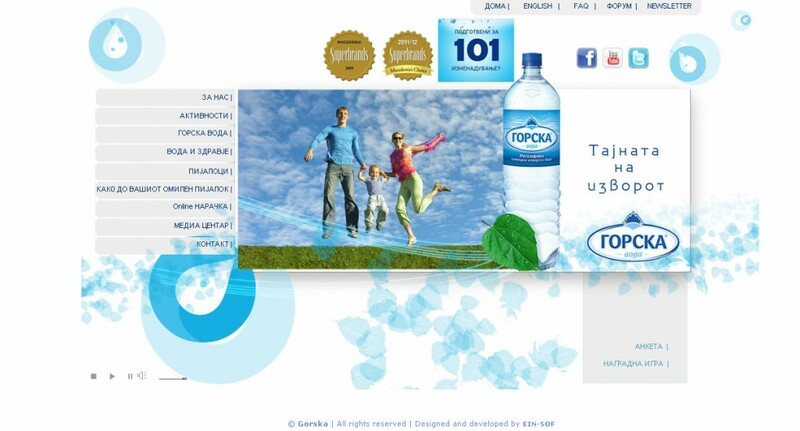 With so many water brands available, and a growing concern over the ecological impact of bottled water, the site had to emphasise that Gorska is the cleanest and most ecologically friendly bottled water to be found. The CMS platform incorporates several modules like Contact form, Pool, Forum, Newsletter, Search, Contest, News, FAQ and Files download. To make the atmosphere more pleasant we selected appropriate music to highlight the authenticity of the proposition.